Field marketing involves company’s representatives performing various kinds of activities in retail locations aimed at attracting customer’s attention to brands and gathering different types of marketing data. To reach these goals, field representatives are assigned such tasks as distributing samples, shelf auditing, requesting feedback, conducting surveys, inviting consumers to follow a brand on social media, performing competitor analysis and more. At first sight, managing such a great variety of field team activities may seem complicated. In fact, with up-to-day technology, it can be very simple and efficient. Today, by implementing a certain type of mobile data collection tool, companies of all sizes are able to provide streamlined data workflow, real-time field-level insights and wide analytic capabilities for field team managers. VisitBasis field marketing software is a comprehensive data collection mobile solution for retail audits, market research, surveys, and competitor analysis that delivers great benefits to field service-based companies. VisitBasis field marketing software allows creating task templates for everything that needs to be checked and helps you to fully eliminate the chaos of paper forms, Excel spreadsheets and emails, providing a comprehensive field service management solution in one application. 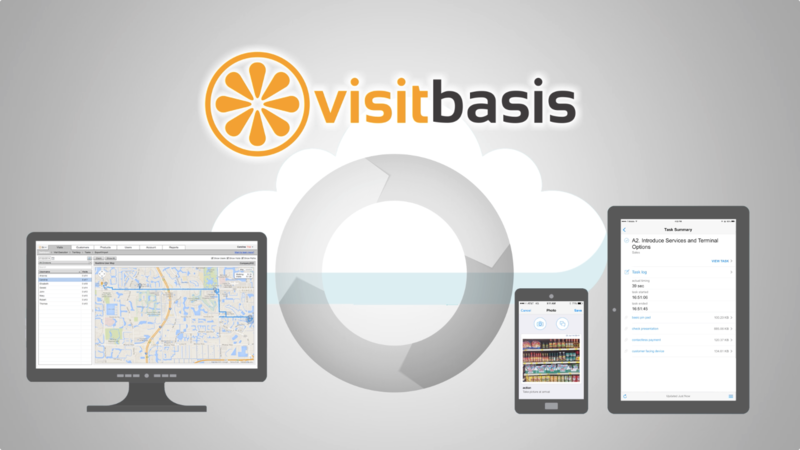 VisitBasis field marketing software involves Cloud data storage and GPS-tracking to maximize effectiveness of retail data collection process. With the VisitBasis Field Marketing App for Android and iOS tablets and smartphones your field reps are able to perform all the tasks very quickly and with minimum effort due to automated data entry and built-in data collection tools like bar code scanner, photo reports, electronic signature. The VisitBasis Field Marketing Software not only gives field representatives mobile access to all data and tools required to collect critical information for store performance analysis but also allows them provide managers with real-time information on what is going on in the field without spending any time on reporting. VisitBasis field marketing software provides real-time retail data access and analysis. Simple, real-time Web-based dashboards are designed to enable better decision-making. Role-based reporting is one of the most useful features for a field team manager as he can get the precise data he needs at the moment. All the reports can be customized to provide necessary information and empower field team manages to make smart decisions. VisitBasis field marketing software allows companies to easily collect time-stamped and GPS-confirmed data from points of sale. A lot of companies already use VisitBasis to streamline business processes and accelerate decision-making. To get more information on how to automate your field marketing activities and store data collection, visit www.visitbasis.com to get your free trial. Just register account and you will be up and running in a few minutes.